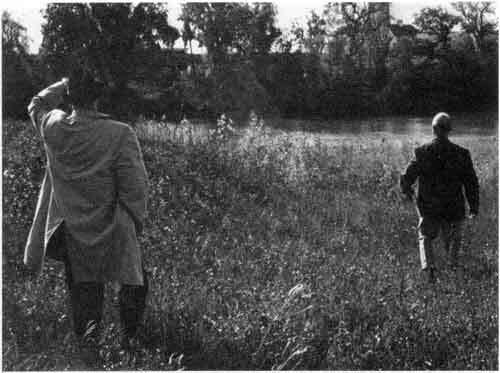 Manitoba Pageant: Location for "The Passage"
Living as we do on the banks of the Assiniboine River close to Headingley, I was very interested in the story of The Old Pembina Trail on page 14 of the January 1960 issue of Manitoba Pageant. 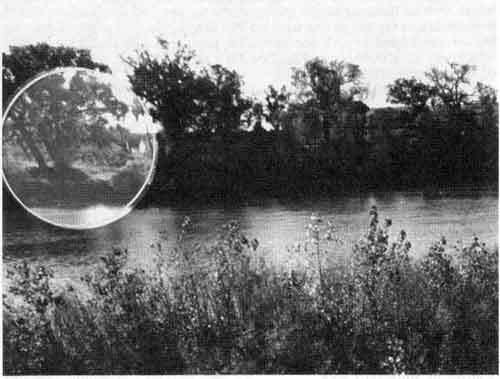 The author, William Douglas, threw out a challenge to find the location of “The Passage” of the Assiniboine on the old trail to Pembina. “Here is a fine project for an enterprising student,” he said. I have awaited a reply but none has been forthcoming, so now I offer my own. There are many places between St. Charles and Headingley where the river might be forded. In the fall of the year it could be waded almost anywhere. Not so however in the spring when, we are told, the Indians would move south to tap the maple trees on the Boyne River. So before starting out on the ground to seek one particular passage, let us look at the map  which was used to illustrate Mr. Douglas’s article and see where the diary of Miles Macdonell  might lead us. The upper photo shows the shallow gully leading to the ford across the Assiniboine near Headingley, and the spotlight in the lower picture focuses attention on the spot where the Red River Carts are presumed to have passed from the river to climb the south bank. The Plan of 1816 is evidently inaccurate so we must rely on Macdonell’s diary plus common sense deductions. Macdonell ignored fractions of miles, (perhaps he measured in nautical miles ), at any rate equal distances from the forks to Sturgeon Creek and from Sturgeon Creek to the Passage must bring us close to Headingley. From the Passage Macdonell travelled another 16 miles to the LaSalle River. If his direction was due south from Headingley this measures 15 miles on a current map, and I am sure that an allowance of 10% can be made for the wandering trail that he would follow. So Headingley fits on present day maps and is in agreement with the diary. What other reasons can we deduce for locating a crossing there? (a) The heavily treed area which existed on the south bank of the Assiniboine extended back at least a mile from the river and would create an obstacle for the original cart trail. In spite of clearing by farmers this treed area still shows on today’s maps. There is however a gap in it east of Headingley where an open plain stretches to the south. 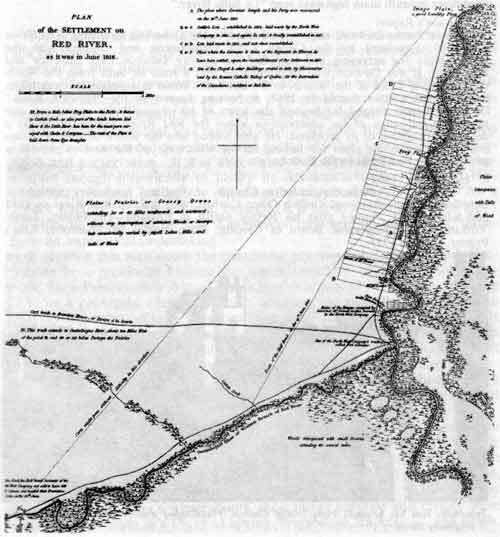 (b) The map with Dawson’s report  of 1859 shows a trail leading S.W. past the Turtle Mountain marked “Hunter’s Track”. This trail leaves the Portage Trail and crosses the Assiniboine River just east of the White Horse plain where Headingley now stands. (c) Why was the early Anglican church located at Headingley? Presumably because there was some settlement or point of interest there. A junction in the trails would be a good place to locate a church. (d) In 1881, by the time the C.P.R. main line passed Pile O’ Bones (Regina) and reached Moose Jaw, there was already a branch line crossing the Assiniboine at Headingley and extending to Carman. Presumably the railway engineers chose this crossing, as did the hunters before them, for its open approach. (e) It is said that Headingley was first settled in 1852  when the flood on the Red River led some settlers to seek higher ground. One of the first settlers there was John Taylor, the schoolmaster. I have asked his son, now over eighty years of age, where the ford was. He thinks it might have been where the railway bridge is now, but the banks there are relatively steep and the river narrower and deeper than to the east. This place would have been chosen by the railway engineers because it gives the shortest span but it doesn’t look like the location for a ford. About half-a-mile east of the bridge, where the church stood, the river widens and there is a shallow pebbly bottom, easily fordable. While Mr. Taylor had heard of a ford, he would not remember back to the time before the railway bridge was built for that was 85 years ago. Unfortunately the Anglican congregation moved their church a few years ago to Portage Avenue from its historic church yard near the river. The trail which led down to the old church and the present churchyard continues in a gentle slope down the river bank to the water’s edge. The cart tracks are easily discernible leading to the pebbly crossing. On the south bank the rise is steeper for a short distance from the water, but again there is a winding road leading away from it and out to the plain. 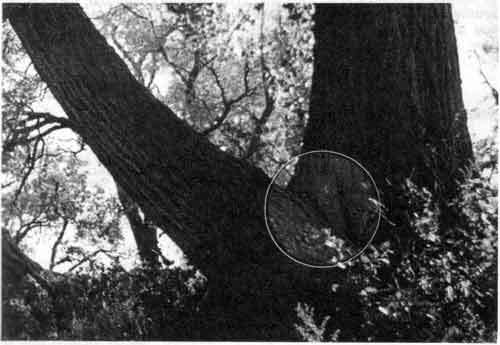 Close to the trail on the south bank there is a cut post completely surrounded by an elm tree that has a trunk circumference of 8 feet. The circumference of the lower branch which helps to enclose the post is 3 feet; truly an ancient tree, so also the post must be very old. Perhaps a line tethered to it helped to guide the struggling horses up the bank. The present owner of the farm on the south bank says that when he first purchased the land buffalo bones were discovered in the locality. Standing on the south bank we can see in our imagination the line of Red River carts filing down the north bank and across the pebbly beach and into the water. Imagine the shouting and the urging on of the splashing ponies. Here on the south bank a rope is run out from the great elm to aid the heaviest carts up the bank. The crossing completed, they file on southward onto the open plain. This is my location for the Passage? Have you a better one? 2. Miles Macdonell’s Diary—Shortly before the outbreak of the American Revolutionary War, young Miles Macdonell went to New York from Scotland with his parents. Then, following the outbreak of war he trecked northward to Canada with the general exodus of the United Empire Loyalists. Macdonell became a captain in the Canadian Volunteers and turned to farming after the regiment was disbanded in 1802. “Selkirk saw in him ‘very much the gentleman in manners and sentiments’ and so marked him as having the qualities of leadership for his colonization venture at Red River.” Macdonell’s letterbook and journal [diary] are held in the Public Archives of Canada. It is from the journal that the mileage estimates are taken. 3. Frog Plain—The original name given to this place by the metis was “Grenouillere,” a word which is defined in current French-English dictionaries as “marsh, swamp, froggery from the root grenouille—frog.” Later is was known as Frog Pond (Henry 1800); later still as Frog Plain, and finally as Kildonan, principal settlement of the Sutherland Scots from the Valley of Kildonan. Frog Plain was also known as the Lower Settlement, and it was thus referred to by Louis Riel on 10 February 1869, when he quizzed the representatives of the French and English parishes on the growing resistance to the Provisional Government, saying: “I have heard rumor of armed men gathering at the Lower Settlement.” See map here for location of Frog Plain. 5. Nautical Mile—Nautical or geographical mile: the sixtieth part of a degree of the great circle of the earth, or 6,080.07 feet as compared with the British statute mile of 5,280 feet. The nautical mile is therefore some 800 feet longer than the British statute mile—the standard land measure in Canada and the United States. 6. La Salle River—A corruption or transposition, perhaps a localism, for Henry’s “Riviere la Sale” (1800). “This small river comes in from the W., taking its water nearly opposite Portage la Prairie, in a long marsh, not above a mile from the Assiniboine. Its first course is S. for several miles, when it takes a sudden bend and runs E. until it empties into Red River, forming the N. boundary of the great meadows of this river. The country which lies between the Sale and the Assiniboine is low and forms in many places marshy meadows, thickly intersected with poplars and willows, which never grow to any height. Moose and red deer are very numerous in all seasons, and in the winter buffaloes resort here for shelter from storms and cold.”—Journal of Alexander Henry, edited by Elliott Coues, first printed 1897; reprinted by Ross and Haines, Minneapolis, Vol. 1, pp. 55-56. 7. Dawson’s Report—Simon James Dawson, engineer, attached to the Canadian Exploring Expedition (1857-58), appointed by the Crown Land Department, and charged with the responsibility for surveying and mapping the country between Lake Superior and Red River. 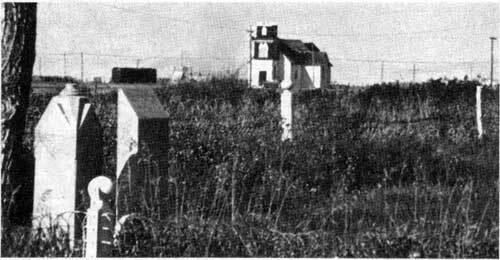 It was Dawson who recommended that a road be built from the North West Angle of Lake of the Woods to St. Boniface. When this suggestion was taken in hand and a road started in 1868, it became known as the “Dawson Road.” Dawson’s Report ranged far beyond the letter of his responsibility—surveying and mapping—and some of his observations about the Red River Settlement reveal a deep understanding of its problems. He also looked into the future of transportation and put on paper his plans for linking up the waterways of the west to provide a passage from Red River to the Rockies. 8. Headingley (1852)—“Parish and village, originally a Church of England missionary settlement, established by the Reverend Griffith Owen Corbett, who reached Red River in 1851 and left in 1865. Named after his former parish in England—Headingley, Leeds, Yorkshire.”—Geographic Board of Canada, Place Names of Manitoba, King’s Printer, Ottawa, 1933. Telephoto lens has brought Holy Trinity Church, Headingley almost to the grounds where it originally stood.